For more info, you can read the IE11 announcement here, and be sure to check out the IE Test Drive site for lots of examples of what you can do with the new version. NOTE: At the time of this writing, IE 11 is in preview release. As such, you can expect that some things may not work perfectly, and performance is not representative of the final release. My purpose in this post is to introduce WebGL for those, like myself, who may be new to the technology. The short version is that WebGL brings a 3D graphics API (designed to be very similar to OpenGL) to the HTML5 Canvas element. So if you’ve followed my series on getting started with HTML5 Canvas, you’re already aware that Canvas natively includes only a 2D drawing context. And while it was possible to play some tricks and get pseudo-3D in Canvas, it wasn’t real 3D. 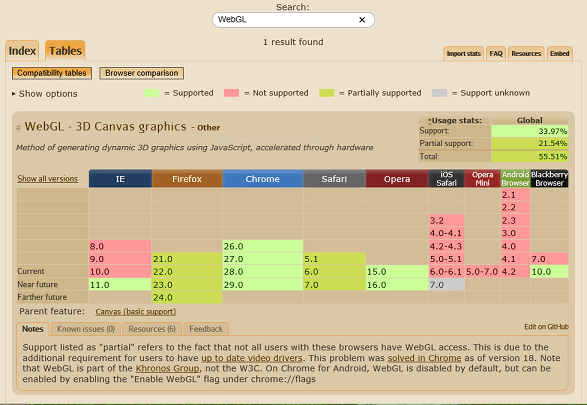 WebGL changes all that. Well, it wouldn’t be an introduction without a hello world example. Of course, in most languages, we use that literally, printing out the text “Hello, World!”. In other environments, that’s either not possible, or really uninteresting. For example, in the world of microcontrollers (Arduino, Netduino, etc. ), hello world usually consists of flashing an LED. 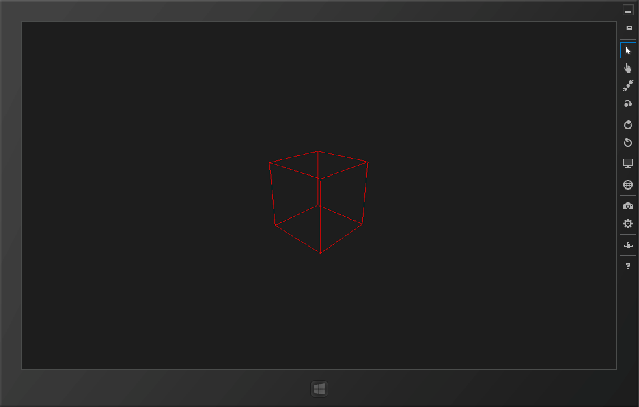 For our WebGL hello world, we’ll show a spinning cube. You can view the working example here. Once having made that change, we should be all set, with a simple Hello World style WebGL demo that will work with any browser that supports WebGL (see the chart above). NOTE: In addition to the advantage of simplicity, another big advantage of using three.js rather than coding directly to the WebGL API is that because three.js supports other renderers, the code you write using three.js may be able to work on browsers that don’t support WebGL, albeit at a performance cost. Even cooler, for those of you building apps for Windows 8, because WinJS apps automatically get the features in Internet Explorer 11, that means that you can also use WebGL to build apps and games for Windows 8, using the same code that you’d use for the web. There’s lots more to play with, of course, including different types of materials, lighting, etc., and you can read about them all in the three.js documentation. It’s a great time to be a web developer. There are great client libraries for everything from DOM manipulation to game development, and powerful tools to help you develop your sites and apps. With WebGL support in IE 11, web developers can bring 3D to their sites with more confidence, and Windows app developers can leverage the same code that works on the web to build cool games and experiences for the Windows Store.